The Greens got 360,000 more votes in 2008 than on Monday - in fact, they lost a larger proportion of their vote than either the Liberals or the Bloc. 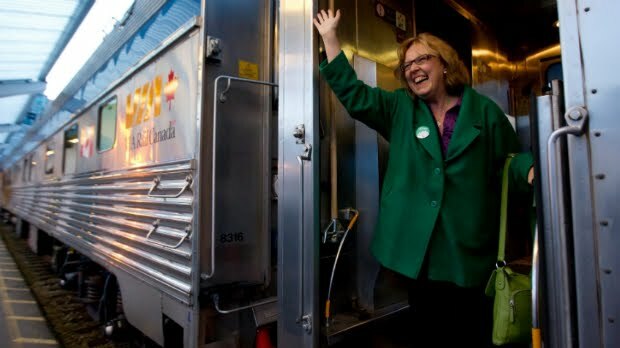 And yet, the 2011 election will go down as a historic night for the Green Party of Canada, having elected its first MP. Making sense of the election that was for the Greens is a lot easier than for the other parties. In short, the Greens gave up on the national campaign and went all in on Saanich. They dragged every volunteer they could find to the riding, polled it heavily, and May spent every waking moment this election tricycling through the riding, mostly ignoring the national campaign. They were rewarded with a seat on Monday, validating her decision to run there. As I said at the time, Saanich was likely the best riding for May and, at the very least, it was a better call than her ill-advised and ill-fated decision to take on Peter MacKay in Central Nova. So what should the Greens watch out for as they drive their one-seat hybrid down the road to relevancy? Having a seat in the House will make a huge difference. Even in a majority parliament, it will give May an outlet to broadcast her message. The challenge for her will be finding the right message. The environment has faded as an issue in recent years, and despite May positioning the Greens as a party who rise above the petty attack that dominate Canadian politics, she has been rather sharp in her criticism of Harper in the past. Striking the right balance in the House will be a challenge. So will be winning that second seat. The Greens were not over 20% anywhere else in the country, and only got their deposit back in 8 ridings. Monday was certainly historic for the Greens, and they have every right to raise a glass of beet juice in celebration. Even though I'm not a fan of the party, May will bring a different perspective to Ottawa and will contribute more to the political dialogue than most backbench MPs. She is a welcome addition to the House of Commons. However this was only the first step on the road to relevancy and there's still a lot of work left for the Greens. Of course, once Canada's New Majority kills the per-vote subsidy, the Greens have a serious financial problem to deal with. By Don, at 9:48 a.m. I have great hope for E. May. Even though I'm not a Green supporter she is a strong advocate about the state of our democracy and has a touch of fiscal conservativeness to her. As a individual she will be a strong voice of reason in the house. By gingercat, at 9:53 a.m.
Don - Excellent point, I overlooked. Though the death of the per-vote subsidy validates their decision to forget the national campaign and focus on Saanich even more. Because in that new reality, the extra 350,000 votes don't amount to much. By calgarygrit, at 9:59 a.m.
And this is a long way down the road, but it will be interesting to see if she holds the seat in the next election. I guess if she does really well in the HoC it's possible, but a lot of us who voted for her (my riding) did it as the obvious united choice to give Lunn the boot. I expect that now that he's gone, at least a portion of us will go back to voting for other parties. Will the Greens raise their national vote but struggle to keep the seat (let along gain others) in the future? By wondering, at 10:11 a.m.
Elizabeth May will have a hard time resisting the petty partisan attacks. Both she and her core Green strategists hate Harper in the same way many of us hate Nickelback. See, we can't just tune it out, it makes us grouchy and we just have to say something nasty, both about the band and people dumb enough to enjoy their music. We won't even trouble ourselves to find a single song we like, or tolerate even a single entry in our playlist. I'm concerned that the Greens have purged their party of anyone free of this closed-mindedness (e.g. Harris, Chernushenko) and are therefore speaking with a weaker and far more narrow, shallow voice. By Robert Vollman, at 11:00 a.m. This is the worst of all worlds for the Greens - and I often voted Green before May came along, so it's not as though I'm happy to say it. What we have here is the worst possible representative of the Greens now holding their first but only seat, in a party that's been reduced to, well, her. It's as though they've consolidated and reinforced their negatives. "Of course, once Canada's New Majority kills the per-vote subsidy, the Greens have a serious financial problem to deal with." Don't think so. The Green Party is full of believers and volunteers (activists and advocates). So long as their voice is loud, there will be enough funding and helping hands for a small operation. May's campaign saw a flow of volunteers into the riding. You can be sure that they didn't sleep in Holiday Inns or dine at Dennys. The activist networks are often well funded and backed by people with great knowledge e.g. environment and conservancy. The harperite's will surely stir outrage. The Greens can only grow. I wish them luck. In this new political environment, the opposition politicians are useless. Harper has his majority. So, the battleground shifts to the courts and the streets. It would be wise for opposition politicians to take a stand somewhere. Make friends and alliances. Dirty your hands. For myself, I'm donating to Justin Trudeau because of his father, and only Justin. I have also just donated 5x that to a conservancy group. I suggest that those opposed to the harperites must support the activists. They have fire in their belly. And, that's no legal limit to your donation. By JimTan, at 11:31 a.m.
No Official Party status, no speaking time...unless an Oppo party wants to donate some of it's time. I dont know if Jack or the Lib's will want to elevate her anymore than she is, though I suspect she'll get way more media time now. By DavidA, at 11:34 a.m.
cg -- here's the really bad deal for the Libs with the Greens. Their vote totals will be better than 2008 in 2015 as she'll be considered more legit, she'll be in the debates and will run a national campaign. Watch for the Libs to be 4th in even more ridings in BC/Alberta and losing their last 2 seats in BC in 2015 due to more vote splits. The Lib slide into irrelevancy in the West will only be aided by May's win. By Peter Jay, at 11:50 a.m.
No Official Party status, no speaking time..."
Most of the media attention goes to the fireworks in HoC. Eliz May may just get 5 seconds of exposure. The importance of May's election is to show that it can be done with her new strategy and star candidates. She took down a long-time MP and cabinet minister. It's a rallying point for activists. All she has to do is to show up at events for good causes, while backing good initiatives. And, building a real organization and recruiting superstar candidates. No doubt, she and the GP face many many challenges. But they're on the way up while the LPC faces oblivion. Can the LPC run a 308 strategy in 2015? At this point, the LPC isn't going to get a superstar leader. Rather, it's time to build your bases. Make friends with people who have friends of friends. So, extend a hand to Eliz May in Ottawa. You have a common enemy. Any enemy of your enemy is a potential ally. By JimTan, at 11:59 a.m. If nothing else, E.May's victory vindicates my view that she made a boneheaded decision (likely out of vanity) to challenge MacKay in Central Nova in 2008. In 2008, the spotlight was on the environment and the Greens were getting a ton of media coverage. Lots of Canadians were kicking the tires. May was in the leader's debates and turned in a decent, if unspectacular, performance. Why she chose to run in a seat where the Greens got 600 votes in the previous election, against a Cabinet minister whose family has held the seat for the better part of 40 years, is beyond me. If she had run in Saanich in 2008, where there was actually a Green base of support, it would have been a slam-dunk. The 'crypto-Green' Liberal candidate came close to defeating Lunn as it was, particularly because the NDP candidate was forced to withdraw. Per the Green/Liberal electoral pact, they would have stood aside for May in Saanich in 2008, giving her a clear shot at Lunn. There's no doubt in my mind that she would have won, look at how she dispatched a Conservative cabinet minister in an election where the Tories were busy winning a majority. Had she done the smart thing and run in Saanich in 2008, she could have spent the last three years promoting the party as an elected MP, in addition to getting a ticket to the leader's debate this year. I'm glad she won, but I'm still scratching my head as to why she didn't run in Saanich in the first place. By ghoris, at 2:42 p.m. I agree with Ghoris. But one thing left unsaid in the comments is that it will be less justification for keeping the Greens out of the debate next time. By Ed, at 3:48 p.m.
here's the really bad deal for the Libs with the Greens. Their vote totals will be better than 2008 in 2015 as she'll be considered more legit, she'll be in the debates and will run a national campaign. The electoral landscape in Canada shifted a lot over the past two weeks. I think it's a bit foolish to predict how it will look in four years. How the Greens do in 2015 will depend on how May performs in the House (and how top of mind the environment is then). By calgarygrit, at 4:12 p.m. When I did some rough number crunching, Central Nova wasn't even in the best 100 ridings for May. There are probably a dozen seats she could have won last election. The decision to run in Central Nova set the Greens back a full election cycle, if not more. By calgarygrit, at 4:13 p.m. I realllllly think that May has little to look forward to other than an MP's salary. Without official party status she will function as little more than an independent, and the loss of the vote subsidy will be extremely damaging to a party that has a threadbare organization across the country. For all the talk about the lack of an NDP "ground game" in Quebec, the Greens have even less. They are a marginal presence outside of a small handful of ridings. Whatever the Liberals' weakness, they official party status, 34 MPs, about five times the support at the worst, and a still-respectable organization on the ground in much of the country. By Josh, at 10:32 p.m.
She is one ditsy lady. Her poor manners and bucked teeth will soon turn everyone off. Does anyone know if she has a high school education. By Cole, at 10:32 p.m. The main problem for the Greens is that they have become irrelevant. What distinguishes them from the NDP, except maybe that the greens support a carbon tax as opposed to cap and trade? 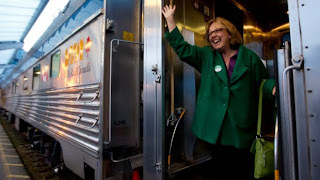 Elizabeth May's victory is in many ways a bad thing for the Green party because it cements the existence of the party as a cult of personality (and while May is likeable enough, its not like she is a rockstar), rather than as a party with a distinct vision for the country. Oh and Robert, I'm with you on hating Nickelback. By hosertohoosier, at 1:00 a.m.
My goodness Cole is a nasty person. Glad he doesn't live next door to me. Must be one of Harper's minions. By Anonymous, at 4:36 a.m.
By muebles en almeria, at 3:29 p.m.
By pay per head call center, at 4:14 p.m. The return of Mad Max?